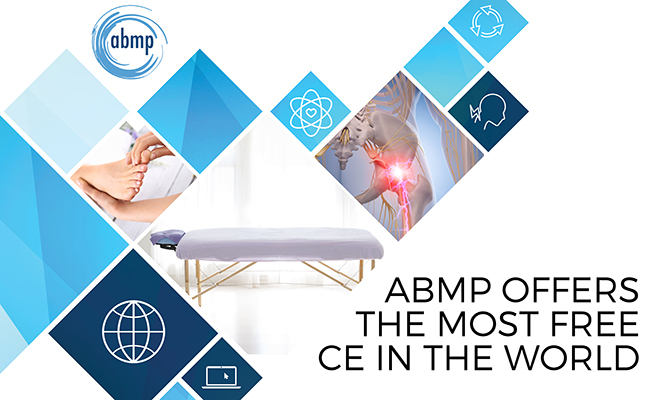 ABMP - The leading massage therapy association in the U.S.
ABMP goes above and beyond to help our members succeed, bringing you the insurance you need, the free CE you want, and the personalized benefits and customer service you deserve. ABMP members already enjoy free continuing education as part of their membership—more than any other organization or membership association. Now, ABMP Certified membership also includes full access to the World Massage Conference Vault, giving members more than 600 on-demand CE courses—the most online massage and bodywork CE in the world! Discover how you can benefit from ABMP Membership. Find out which level of membership is right for you. Get instant access to our award-winning magazine’s digital edition. Sign up for one of our upcoming webinars. The highest-dollar coverages available: $2 million per incident and $6 million per policy year. An individual aggregate, which means your coverage limits are not shared with other members (other providers pool their coverage). Occurrence form coverage to protect you from late-filed claims. Coverage wherever you work, plus no charge for Additional Insured Endorsements. Need help understanding liability insurance? Check out our handy guide. Your own website, which you can set up in an hour with our easy-to-use web builder. Body Sense magazine and customizable marketing materials to share with clients. 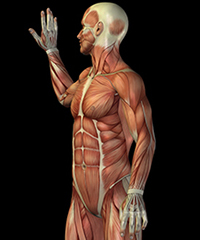 Massagetherapy.com, our client-education site featuring a therapist locator service with your own personalized listing. Increased referrals and bookings through ABMP partners including MassageBook, ThriveHive, and more! The award-winning Massage & Bodywork magazine, both in print and digital editions, full of articles from the leading names in the profession. Several helpful guides to help you take the next step in your career, like the Successful Practice Handbook and Let’s Go! resource manual. ABMP members receive big discounts on massage tables and supplies, cell phone service, hotels, rental cars, retail goods, and much, much more! See all of the discounts available to ABMP members. Expectmore customer service that will be there when you need us to answer questions and help you get the most out of membership. Legislative support, information, and resources to protect your interests on the issues that are important to the profession. A dedicated staff to make sure your needs are met and your membership value is always increasing. Free CE hours available for 200+ on-demand webinars! Award-winning publications, including Massage & Bodywork. 50+ discounts on massage supplies, cell phone service, and more. A professional website, plus our easy-to-use web builder. ABMP Five-Minute Muscles, our dynamic new muscle review program. Even bigger discounts on massage tables and supplies, and more. Access to the World Massage Conference Vault of 400+ CE courses. Free music downloads from At Peace Media. Ebooks with free CE on topics like oncology massage. Top listing on the Massagetherapy.com referral service. Unique ABMP Certified member ID materials to display to clients. Student or recent graduate? See ABMP Graduate pricing! Provides access to on-demand continuing education courses, but does not include liability insurance. Features all digital benefits, including 50+ partner discounts, digital Massage & Bodywork, and more. A great choice for massage therapists and bodyworkers outside the United States and for individuals in professions related to bodywork. ​ABMP's award-winning magazine brings you more articles from the top names in the profession than anyone else. Learn new skills, gain information to boost your practice, and stay up to date on the biggest news in the profession. Presentations from the 2018 ABMP CE Summit: Common Client Conditions are available in the ABMP Education Center, where members earn free CE and anyone can try a sample webinar. The Skin Cancer Foundation, the leading nonprofit organization for public and professional skin cancer education, has launched Carcinomas & Keratoses, a new digital publication that sheds light on the most recent and important developments in keratinocyte cancers and precancers. 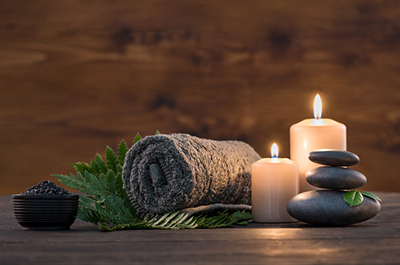 Elements Massage announced a new a hemp-infused therapeutic massage service, becoming the nation’s first massage franchise brand to offer such a service. All hands on deck! 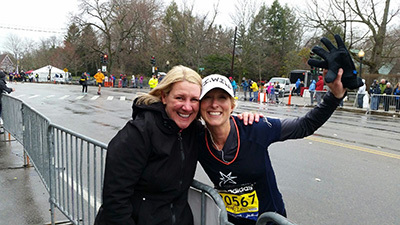 Drew Freedman of The Boston Bodyworker is looking for volunteers to provide 30-minute massages and valuable education to Boston Marathon runners & guests through the inaugural Feel Better Boston event. What makes Massage Envy a great place for therapists to work? Read this blog to find out the benefits of working with this leading national massage franchise brand. Two weeks from today some 30,000 runners will take on the Boston Marathon! And four of them are part of the 2019 Running for Research team raising funds for the Massage Therapy Foundation (MTF). In celebration of our recently completed ABMP School Forum, our partners at Performance Health are providing ABMP members an exclusive offer of 25% off (30% for ABMP Certified members) for the entire month of April at www.bonvital.com. ABMP has teamed up with Nationwide to offer you special savings on insurance. Protect what matters to you for less with a members-only discount when you enroll in an auto or powersports policy. ABMP members get exclusive access to marketing resources for your business, including marketing ebooks and webinars presented by the marketing experts at ThriveHive, plus 60% off your first year of ThriveHive.